FUNCTION: : These are the steel rails that the green folders hang on for a side-to-side filing system. FEATURES: An exact replica of the original file bar with specifications that meet or exceed the Steelcase design. The bars will not twist or bend under a full cabinet load of paper as it will with other generic "knock-off" brands (especially the 42" models). Our parts perform with the full functionality and durability of the original factory part - we guarantee it! PHOTOS: The photographs shown are the actual parts we manufacture, so "what you see is what you get". Some sellers use old catalogue photos as identification or for discussion purposes only. Upon ordering they'll typically send you something completely different and often inferior. Buyer beware. MATERIALS: 1/16" thick galvanized steel. Quality made in the USA using USA materials. Heavy-duty and made to last. LENGTH: To choose the correct size, measure your file drawer from left-to-right down inside where the green hanging folders reside. See the drawing labeled "A" Dimension & match your measurement to the cabinet length. NOTE: file cabinets sizes are based on their outside dimensions (from side-to-side). 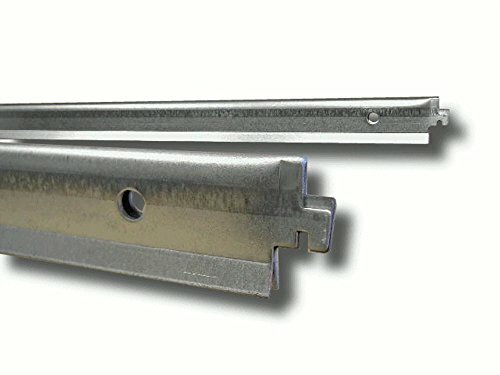 File bar actual lengths are slightly shorter to allow space for the slide bearings. INSTALLING: Insert one end of the bar at a time into the stamped holes of the drawer wall just as in the original design. Afterwards, the slot in the bar locks into the drawer wall edge and keeps the bar in place. If you have any questions about this product by Northland Online, contact us by completing and submitting the form below. If you are looking for a specif part number, please include it with your message.